Save 22% with Boot-Loader v2.0! With great pleasure we would like to invite you to join Boot-Loader v2.0 second Birthday Celebration! 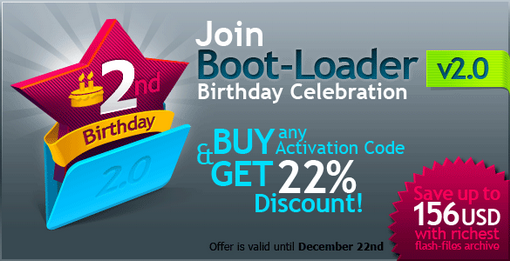 On this occasion you can take advantage of the best offer ever – get 22% discount on any Boot-Loader v2.0 Activation Code! Save up to $156 with the richest flash-files archive on the web! Hurry up, offer is valid until December 22nd!